Jessica Jones had the best first season out of all Marvel shows on Netflix. And being phenomenally good puts a lot of pressure on the second season to be even better. Season two had bold choices, that took something from what made season one edgy but added a nice new touch to Jessica Jones. In terms of character development, season one’s weakest point, this season was a major improvement. Instead of focusing on one big villain, the show brought every character’s greatest fear. We’ve got more insight into the background of every character on the show, and I mean every. No one was left out. And what made all of those personal problems work, is that they’re all connected to Jessica Jones. The writers aren’t afraid to make their female protagonist unlikable, instead, they use her unlikability to drive the supporting character’s decisions and motivations. And the fact that you can sympathize with all of them, despite most of them not deserving it, is a great testament to how impressive the character’s progression was this season. Plot-wise, the story’s might have had a predictable ending, but the leadup to it is unexpectedly startling. There’s an obvious toning down from the noir feeling from season one, which I didn’t like but I understood. This season was a little slower and had less graphic scenes, but again it’s not something that I missed. I loved the little cliffhangers at the end of almost every episode, they add a lot to the binge quality. One of the few things I didn’t like was the aspect of Jessica’s powers. This season was supposed to be about her origin story, but I felt that was abandoned for the sake of introducing new characters. We know Jessica can jump really high, but we never see her actually doing it. It’s a hard bargain to want her to fly, especially with a tv show budget. But if the CW shows can afford it with Supergirl, I’m sure Netflix can too. Another thing I didn’t like is that they destroyed the only good relationship Jessica had, and if this isn’t a leadup for Hellcat “Trish” to be Jessica’s enemy next season, then it was completely pointless. Malcom’s development was believable, except with his brief relationship with Trish. And his decision at the end of the season wasn’t explored more, but it lays down a plot point for the next one. The return of Killgrave, the greatest MCU villain, in my opinion, is great. While he’s not physically there, he’ll always remain the worst part of Jessica in her mind. New characters like Oscar and his son save Jessica from being too isolated in the finale, where she managed to distance herself from everyone she previously knew. Hopefully, this serves to have a positive effect on Jessica going forward. Jessica Jones Season two is neither an upgrade or a downgrade. It is on par with season one, which was already extraordinary on it’s on. It’s very different, yet it has everything I loved from the previous one. I loved the constant easter eggs between the show and the movies but knowing that it’s probably a one-way street just makes me sad. 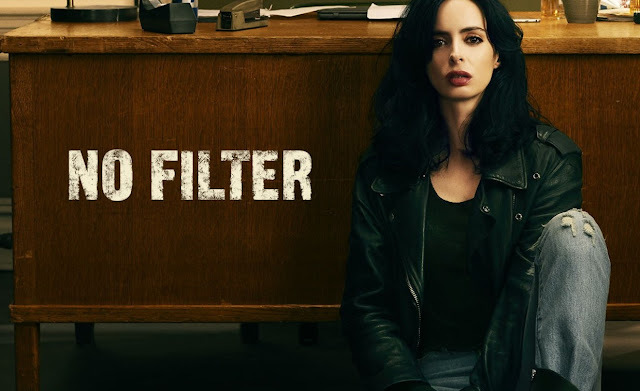 Jessica Jones Season 1 and 2 is currently streaming on Netflix.